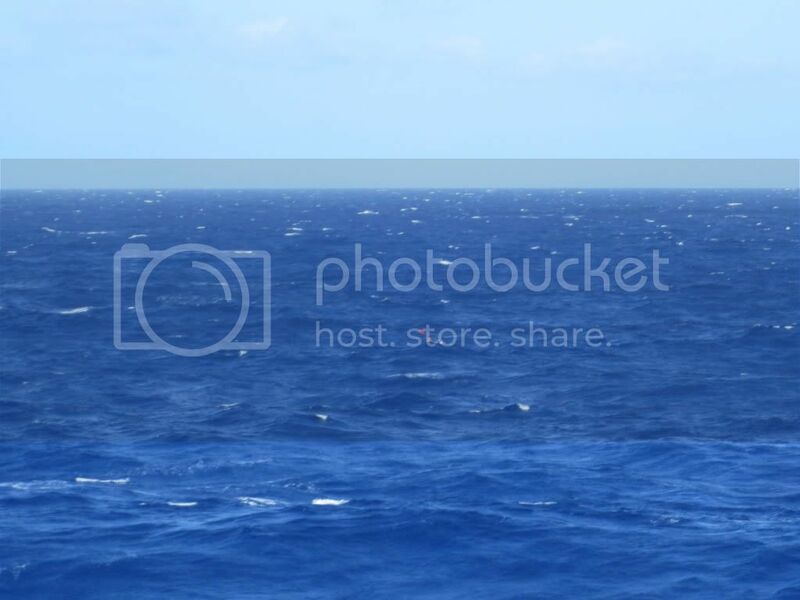 This past weekend I went on a cruise with my mom on the Navigator of the Seas to the Western Caribbean. The trip was fun, but never did we expect what occurred on Sunday afternoon. I was laying in the Solarium getting some sun when I noticed the shadows were rotating rather quickly. 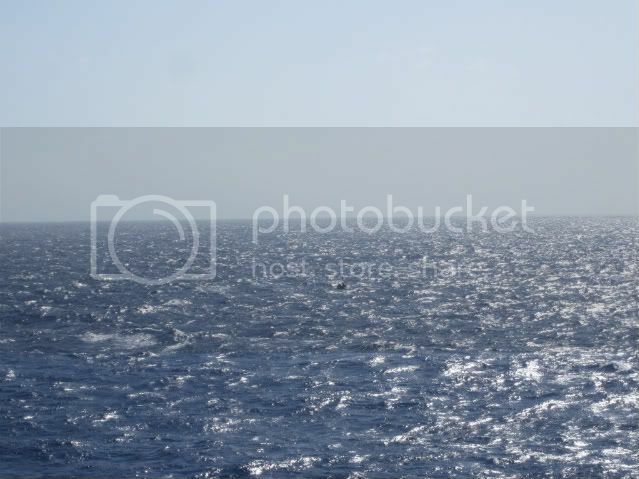 I glanced out at the ocean and realized we were turning rather sharply. Well... as sharp as a 1,000 foot cruise ship can turn! I thought it was strange, but I figured it was just the course we were taking and laid back down. A few minutes later the overheard speaker bell dinged. Captain Patrick Dahlgren came on the speaker and stated that we had made a U-turn because a vessel had been spotted in the water with a few people that appeared to need help. 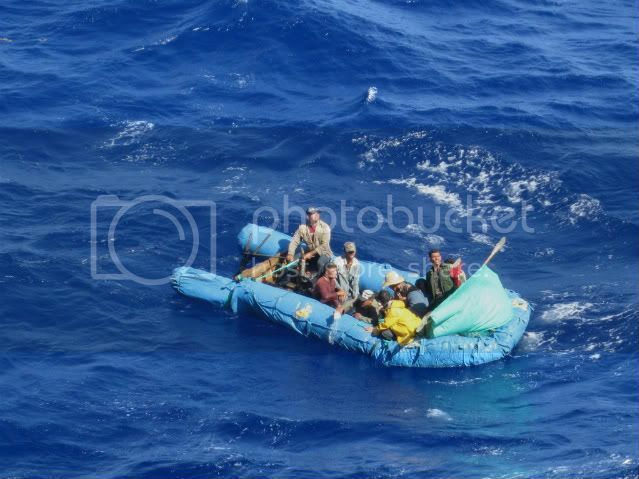 I immediately knew they were Cubans- we were 40 miles from Cuba at that point. I went down to my room and threw something over my bathing suit. I immediately headed to the helicopter pad. I figured this would be a good spot to see what was ahead being at the front of the ship. We circled around for a bit, almost in a figure 8 like pattern for 45 minutes. Then they radar was turned on- I noticed this because one of the devices was right on the bow of the ship on the helicopter pad. Here is a view from where I was standing on the Helicopter pad while the Captain and Officers stood on the wing bridges with binoculars. Eventually the ship slowed to almost a stand still. Someone else on the helicopter pad began to yell and point. At first I couldn't see anything, but then I saw the black spot from afar bobbing up and down in the waves. Do you see the dark spot in the water?? The ship drifted closer to the vessel. A few people had binoculars out. One guy said there were 8 of them onboard. 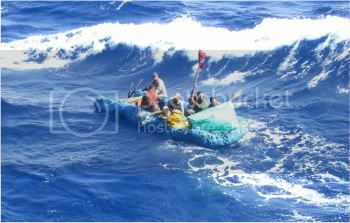 The waves appeared to be small from the ship, but once the raft was closer to our ship we realized how big they were. The closer the raft got to the ship the more we realized that this raft was very much home built. The surf picked up and began to take them back away from our ship quite a ways. The small red dot below was their oar with the red cloth wrapped around it. 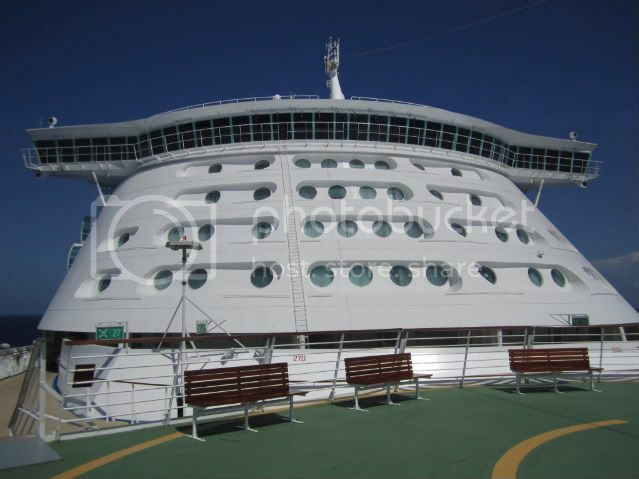 People from all over the ship were now on the Port side of the ship. The Captain came back on the loudspeaker to announce that we would stay next to them until the Coast Guard arrived to pick them up. A roaring applause swept across the decks as people were happy to hear we would stay nearby to ensure their safety. Every deck that had a space had passengers crowding to see the action. 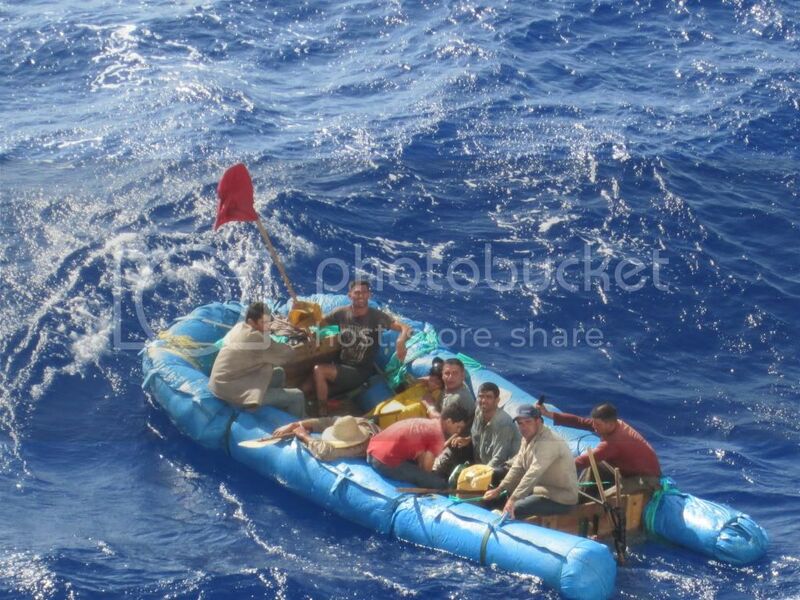 The captain then came over the loudspeaker again because they had noticed that the raft was taking on water. He finally received clearance to take them on to the Navigator because the situation was now dire. They were using small water bottles to dump out the water. There was no way they would successfully keep the water out of the little raft. There were actually nine people in the raft, 8 men and one woman. The captain made this announcement to everyone when he stated we would be taking them onboard our ship. The decks again erupted in applause and cheers. It was truly touching to know that people deeply cared for other people's well-being and lives. Whether you are for or against the immigration of Cubans and other people fleeing their countries for a better life, this was truly a touching moment. It took some more maneuvering of the cruise ship to finally get the raft close enough. 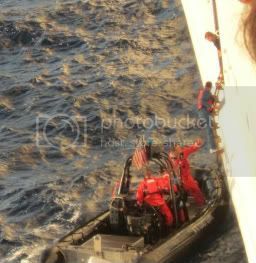 Crew members opened the side of the ship on deck one and threw a large rope out for the rafters to catch. The seas were not very calm and I could tell it was a struggle for those men to hold on to the rope. 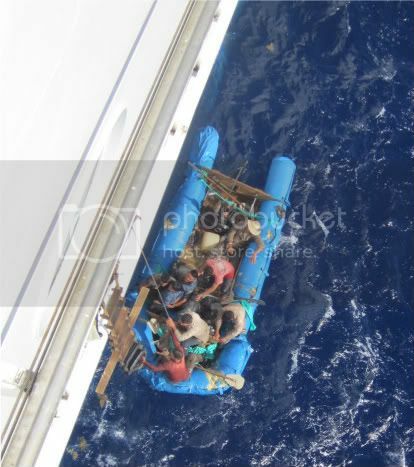 The crew members carefully lowered a wooden rope ladder and began to instruct the refugees on what to do. One man looked incredibly fatigued and quite possibly dehydrated. They hoisted him up first, then the woman. Slowly they were all brought in to the Navigator. 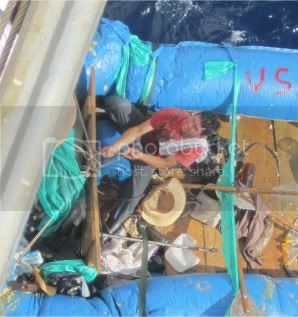 The crew members then tossed a can of red spray paint out the the final two refugees on the raft. The one man sprayed lettering on the raft that indicated that the people were safely taken off the raft and are being held until the Coast Guard arrived. You can see the man in the red shirt struggling to hold the rope and stay on the raft. Now with one man left they had to carefully get him on to the Navigator without the raft pulling away from the ship when he let go of the rope. 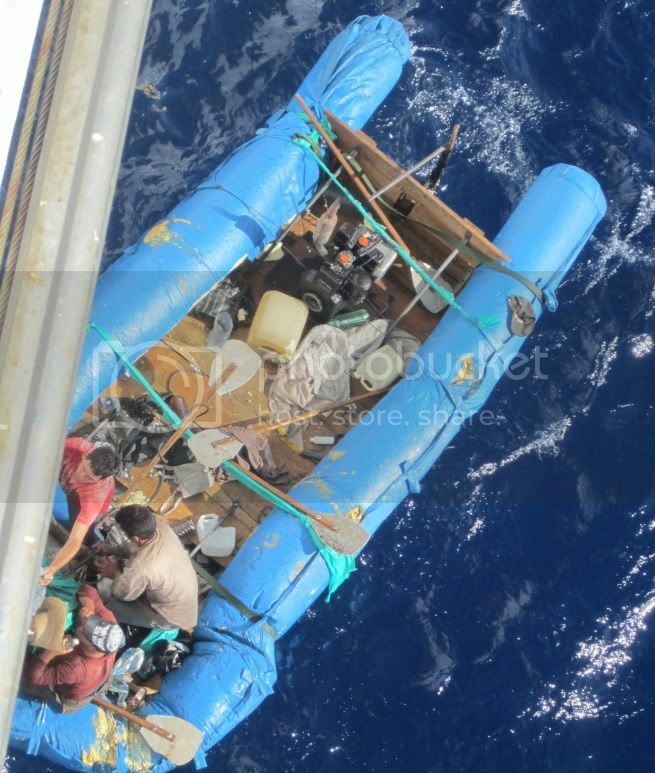 You can see all the stuff they had in the raft. The bottom was made of wooden boards. The blue tarp was wrapped around insulation/fiberglass type materials. The oars were made from what appeared to be street signs and wooden poles. They left all of the other things behind in the raft. At this point nearly three hours had passed since everything began. I was tired as was everyone else. I went in and got ready for dinner. While I was at dinner around 7pm, I noticed people crowding the windows on the port side of the ship. 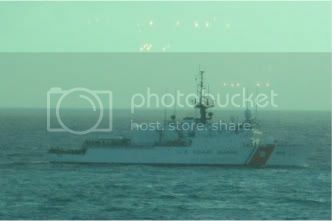 I went over and saw the Coast Guard cutter off in the distance. 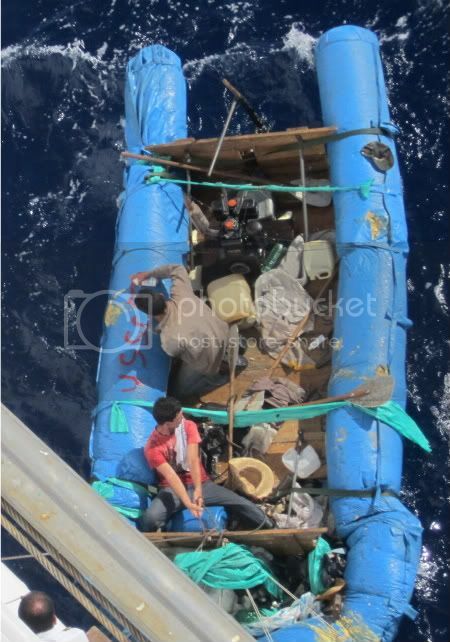 Closer to our ship was a smaller boat- used to take the nine Cuban Refugees back to the cutter. They took a few trips to get them over to the cutter 3 or 4 at a time. The man in the blue jumpsuit is one of the refugees. They dressed them in Royal Caribbean maintenance suits to get them out of the wet clothes they were wearing. Getting them on to the Coast Guard boat was more challenging than getting them off of their raft. 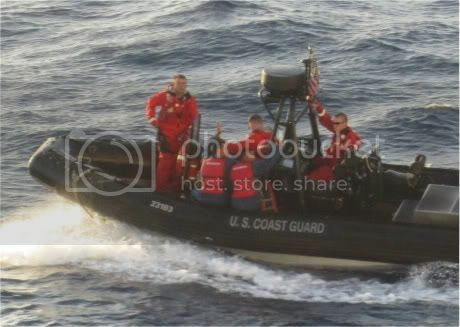 The CG boat was bouncing around a lot more and I was concerned for the safety of them. The woman was still very afraid, with good reason, and was crouched down low. 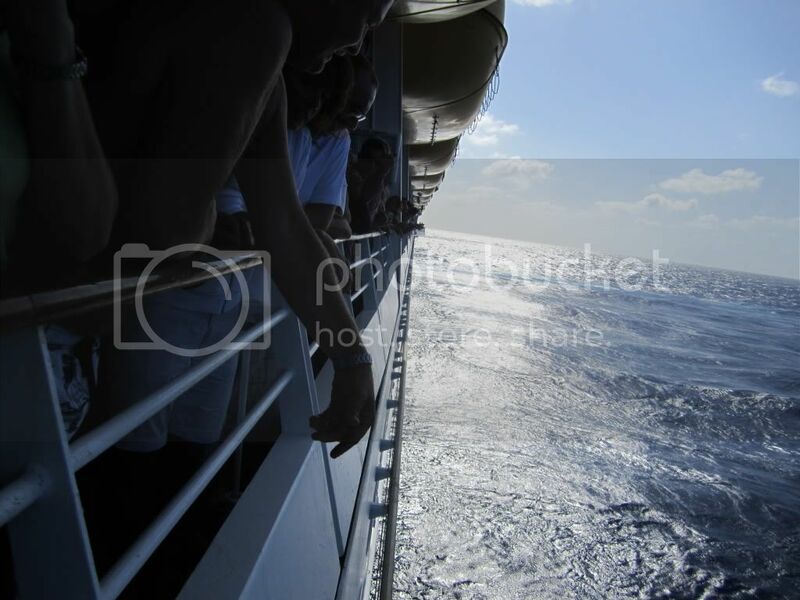 The men waved and smiled to all the friendly passengers on the Navigator. I am sure they are unhappy to be sent back to Cuba when this is all said and done. Thankfully our cruise ship and their raft crossed paths at the right moment. Once they left I felt very sad. 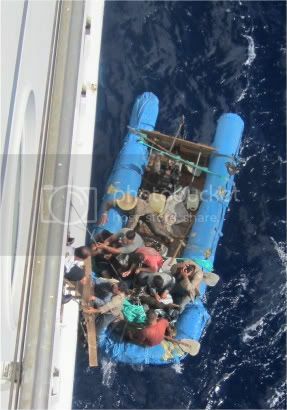 It must be so hard to risk your life and go out on a makeshift boat because you feel that things are terrible in your home country. I thought I would share this incredibly moving experience with everyone.